Despite the changes brought about by the U.S. radio frequency (RF) spectrum auction, wireless microphone systems have never performed better. Learn more about best practices for wireless system use here. When the U.S. radio frequency (RF) spectrum auction conducted by the Federal Communications Commission (FCC) wrapped up in April of last year, the clock began ticking on wireless systems operating in the 600 MHz band. Specifically, the auction resulted in the loss of 614 to 698 MHz (UHF channels 38-51), so the remaining usable bands will be from 470 to 608 MHz (UHF channels 14-36), joined by 174 to 216 MHz (VHF channels 7-13). T-Mobile and others spent billions to acquire this share of the radio spectrum and are commencing services across the country. Once any auction winner begins testing in the 600 MHz spectrum in a region, it becomes illegal to operate wireless microphone (as well as in-ear monitoring and intercom) systems in that cellular block. The fine for doing so is more than $10,000 per day, per frequency. The bottom line is that users should be putting alternative arrangements into place for all equipment operating above 608 MHz by the end of this year, so it’s certainly not too early to begin planning and budgeting for replacement or re-tuning (where applicable) of these systems. Know that time is no longer on our side. For more details and updates, be sure to visit ProSoundWeb regularly. Fortunately, all reputable wireless manufacturers have been planning for this eventuality by designing systems with wide tuning ranges, flexible operation, and good receiver filtering. Many transmitters also offer user-selectable RF power that can be quite helpful in tailoring for high-channel-count and short-distance applications. In addition, a lot of work has gone into efficiently using the available spectrum, so that more wireless system channels can work together without interference within a particular 6 MHz television channel or other patch of available spectrum. Key to this spectral efficiency is digital transmission of the signal between the transmitter and receiver, as digital systems can be designed to offer important tradeoffs such as range, channel density and audio fidelity. Further, more manufacturers now offer a range of options in the VHF bands, and there are also systems available in alternate bands, including 1.8 GHz, 2.4 GHz, 5 GHz, 6 GHz, and other bands as well. In general, these alternative bands are best used for specialized purposes because higher frequencies don’t have the same propagation characteristics as the VHF and lower UHF bands. 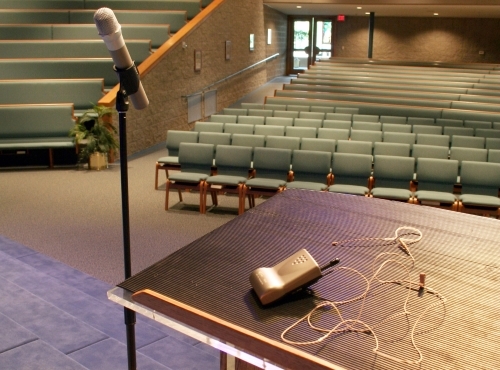 The introduction of digital wireless has also coincided with a push toward digital audio networking and computer control within the audio equipment chain. Touring-class wireless is likely to have the ability to be remotely monitored and controlled, and with integrated AES/EBU or (Audinate) Dante, receiver outputs can offer the option of keeping the signal in the digital domain from the stage through the console to the loudspeaker system. Some systems have also added technologies for increasing reliability and resistance to dropouts, transmitting the same signal on more than one frequency (frequency diversity) and transmitting the same audio data in different time slots (time diversity), with algorithms at the receiver reassembling the digital information into coherent order. Because the emitted signal from the transmitter is digital and the source audio has been converted to data, the audio can be encrypted before it is sent – and therefore protected from being monitored by anything other than its assigned receiver. Security is now readily available for applications that require it. Encryption at levels of 128-bit and 256-bit is common, and at least one recent system has upped the ante to 512-bit encryption. Attention has also been directed toward placing antennas closer to the performing area where the transmitters are in use. Some of the available antenna systems are active, boosting the received signal level before it travels to the receiver via coax cable. Directional antennas accomplish double duty, with increased sensitivity aimed toward the desired signals and lower sensitivity at the rear to attenuate interfering RF signals within their null zones. Several manufacturers also offer very good and constantly updated, software packages that help to manage and monitor wireless system performance over a network, from pre-show planning through post-performance analysis. With all of this in mind, the systems presented here in our roundup (next page) are more powerful and flexible than ever before.